Smart home control – Alexa at your service! Echo Dot provides hands-free voice control for Amazon Music—just ask for your favorite artist or song, or request a specific genre or mood. You can also search for music by lyrics, when a song or album was released, or let Alexa pick the music for you. Listen to any song with Amazon Music Unlimited. Pandora, Spotify, iHeartRadio, and TuneIn. Echo Dot works with smart home devices such as lights, switches, fans, thermostats, and more from Philips Hue, TP-Link, ecobee, WeMo, SmartThings, Insteon, Lutron, Nest, Wink, Honeywell, and more.including starter kits for easy setup. Just in the last few months we’ve added Alexa calling and messaging, exclusive voice-shopping deals, and thousands of new skills from third-party developers. Skills add even more capabilities like ordering a pizza from Domino’s, requesting a ride from Uber, tracking your fitness with Fitbit, ordering flowers from 1-800-Flowers, controlling your TV with DISH Hopper, and more. Enabling skills lets your Echo Dot do even more—simply discover skills you want to use in the Alexa App. To enable a new skill, just ask Alexa. Overview Add Alexa to any room in the house. Can connect to your speakers over Bluetooth or 3.5 mm stereo cable. Hands-free Alexa-enabled speaker that fills any room with immersive 360° audio. Everything you love about Alexa and now she can show you things. 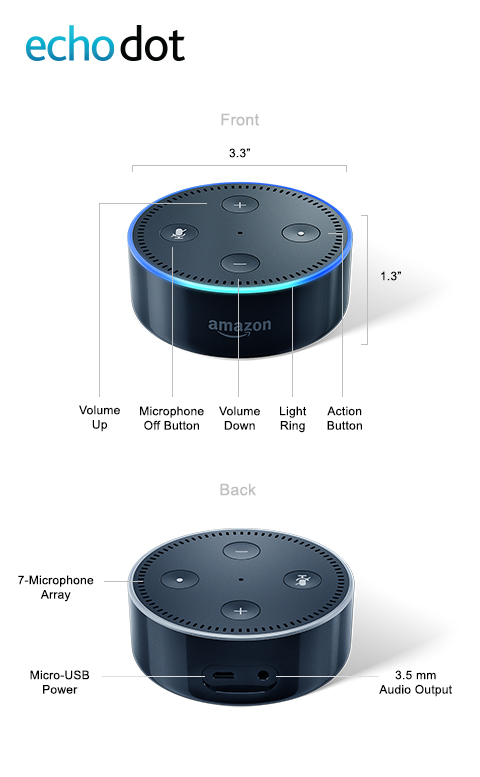 Alexa calling and messaging Call or message anyone with an Echo, Echo Dot, Echo Show, or the Alexa App. Call or message anyone with an Echo, Echo Dot, Echo Show, or the Alexa App. Live video visits and messaging between Echo Show devices or the Alexa App. Call or message anyone with a supported Echo device or the Alexa App. Audio Built-in speaker and support for connectivity to external speakers or headphones. Fills the room with immersive, 360° omni-directional audio; separate woofer and tweeter for deep bass and crisp high notes. Expansive, stereo sound powered by Dolby; dual full-range speakers for rich bass and balanced listening.